Bill English’s decision to resign last week was the right one. Winning the election but losing government would have been a devastating blow. Once over the shock of the new reality, he would have realised his heart was not in a three year battle for Government, having already served the country for 28 years as a Minister of Finance, Deputy PM, and Prime Minister. We thank Bill English for the significant contribution he has made to public affairs in New Zealand and wish him well in the future. The National Party’s future is now in the hands of one of four contenders: Judith Collins, Simon Bridges, Amy Adams, and Mark Mitchell – although Steven Joyce has not ruled himself out. The vote will be held by a secret ballot of their 56 MP Caucus on February 27th. If one candidate does not receive the required 29 votes, the lowest-polling candidate will drop out and another vote taken until a winner can be declared. The election of a new leader is a critical decision, which is why so many Party members and supporters are lobbying National’s MPs to share their views on who they believe should be the new leader. It gives ‘new’ National an opportunity to return to its roots as a party of principle, freedom and personal responsibility. Is that what National really wanted, when they passed the law? Is that what new National wants? The Court of Appeal Judges in the 2003 Ngati Apa case that triggered the whole foreshore and seabed controversy certainly didn’t expect that sort of outcome. So while they believed some customary title might still exist, they also explained that to qualify, claimants would have to have excluded everyone else. And there’s the dilemma. Unless Parliament amends the law as a matter of urgency, to provide a definition of ‘exclusive’ for the Court to use, a Judge will to make that determination. If they came down on the side of the Judges of the Court of Appeal and ruled that exclusive use means to the exclusion of all others, then only claims to remote areas of the coastline would be likely to succeed. If, however, a Judge ruled along the lines of the former Minister – that as long as third parties using claimed areas have abided by the tikanga of tribal applicants, they will not have interrupted the tribe’s exclusive use and occupation of the claimed area – then a majority of the of the 200 applications to the High Court are likely to succeed. “A major risk to coastal recreation is the creation of wahi tapu or so-called sacred areas, where the public is excluded, both on the beach and out to sea. In areas where the public is excluded, they are subject to fines of up to $5,000 for every trespass. The law also allows the areas to be patrolled by the tribal group, and fisheries rangers. “No wahi tapu have been granted so far. But most of the claimants appear to want them. 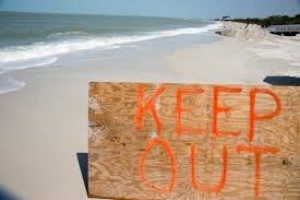 This is the sort of power some tribal groups dream about – locking the public, including other tribes, out of their formerly publicly owned beaches and coastal areas. Other concerns about the Act include funding. As it stands, tribal applicants can receive over $300,000 in taxpayers’ money to help prepare High Court claims that could deprive taxpayers of their rights to the coast. In comparison, anyone wanting to oppose the claims has to pay the Court a $110 filing fee for each claim. This means over $22,000 is needed in filing fees alone by any group wanting to oppose all 200 High Court claims – on top of funding their legal representation. It’s an ironic situation where those who stand to benefit from legal actions are given free legal representation, while those who defend the public interest, get nothing. Does new National think that’s fair? Putting concerns about the Act to one side, we have become aware, during our research, that tribal applicants are arguing that the absence of any strong opposition to their claims is indicative of public support. To counter this deception we have been encouraging as many people as possible to register Notices of Appearance and pay the $110 filing fee per claim so they can engage in the process and oppose the claims. Since the public is largely unaware that their local beaches have been claimed, or that a deadline for opposing the claims has been imposed, we – along with many NZCPR readers – have written to the responsible Ministers asking for the cut-off date to be extended and widely advertised, and for the details of the High Court claims to be published on Government websites. I would now like to report that our voices have been heard! Today the High Court published a list of all of the claims HERE . While the actual applications also need to be posted – so the public can see exactly what is being claimed (you can see them on our website HERE) – and the deadline needs to be extended and advertised – at least it’s a start! As you may be aware the NZCPR has been fundraising to enable CORANZ to file Notices of Appearance for all 200 High Court claims. This has now been done. But in the interest of having as many groups as possible opposing all of the claims, I have just managed to convince a landowners’ advocacy group to expand their appeal from the 14 or so claims that cover their district, to the 200 claims that cover the whole country. I have also made a commitment to them that the NZCPR will try to raise the $20,000 extra that they will need to cover the extra cost of filing. So, I would now like to ask anyone who is concerned about the claims process, but is not in a position to lodge a Notice of Appearance themselves, to consider contributing to our new fundraiser to assist the landowners’ group in lodging Notices of Appearance on all 200 claims – you can help by clicking HERE. Their involvement means that every tribal claim will now have at least two national lobby groups opposing them – one defending the rights of recreational users of the coast and the other standing up for public and landowner rights more generally. And with regards to the extremely serious problems with the Act, I wonder if any of National’s leadership candidates will be prepared to work with the new Government to amend their law to prevent the possibility of the whole coast going under tribal control? If so, let’s hope they are the one who is elected! Should Labour withdraw taxpayer funding to tribal groups claiming the coast?